Far from people just sitting around a table talking, forest collaboration is an ambitious and active effort. Our process is a community effort that brings together residents and all federal lands stakeholders to hash out differences and get to an agreement on how to accomplish Ochoco National Forest and Crooked River National Grassland projects. We create a place where local citizens, businesses, and elected officials along with other federal lands stakeholders voice their values and views about should happen with public lands. We seek out local community input to identify priority areas for projects. Community values are used along with science as the basis for decisions. We work in partnership with U.S. Forest Service staff. The FS is part of the discussion, providing information and suggestions, but doesn’t have a vote in deciding what we do. We start with projects that are simple in scope and grow trust between group members, so larger, more complex work can follow. Our projects are meant to allow people to enjoy and benefit from public lands in the long term, not close them off. We balance the needs of people, wildlife and fish because that is the only path forward to a healthy forest and a healthy community. What’s happening in our forest is serious. The buildup of fuels, overgrowth of shrubs, and tree stands weakened by disease and expansion of fire-intolerant trees like fir are creating a powder keg. This puts bordering communities at risk of mega-fires. Such high-severity fires disrupt businesses, forest access, and daily life. They damage forest ecosystems far into the future. They can threaten the safety of residents, visitors, and firefighters. They’re costly. A more predictable, sustainable supply of timber and woody material for forest products jobs. Other steady forest-related jobs (restoration, firewood gathering, forage, hunting, mushrooms). 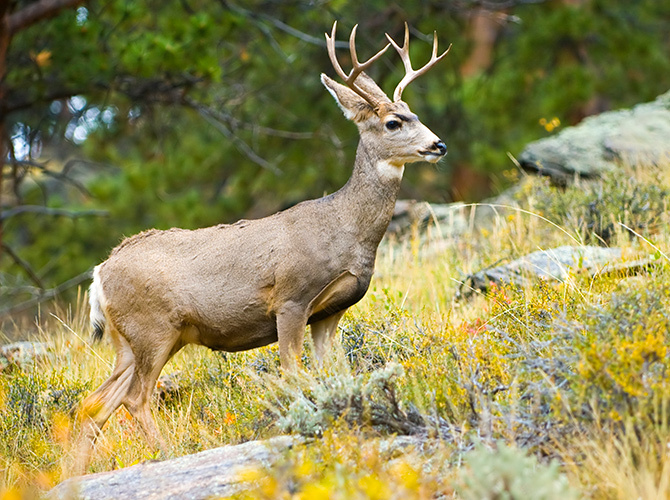 High-quality wildlife habitat for stable wildlife populations. If we want multiple uses and forest access for the future, we need a healthy, fire-adapted forest. The Collaborative is working hard to build community values into each of our plans to restore the Ochoco National Forest.